Every spring more than 100 million viewers watch the Eurovision Song Contest. As many as 43 countries, including Israel which has won the contest three times, take part in this glamorous event. As the Eurofalsh performers take the stage at a club in Tel Aviv the audience is excited, the show starts and the magic begins. 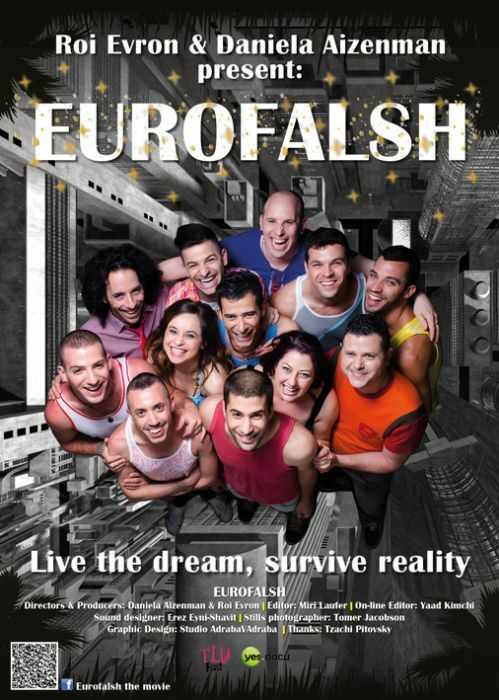 Eurofalsh are a colorful group consisting of 10 young gays and 2 straight women who passionately perform Eurovision songs by lip-synching the words and mimicking the choreography and costumes. One song follows another but as the evening ends the stage is cleared, the audience departs and the magic disappears... to reveal reality. Miki, a married teacher, wants to have a baby but fears growing up and having to give up the stage. Eran, the group's founder, struggles with bankruptcy, with living with his mom and with repeated rejection from Tel Aviv's gay bubble. His main comfort is the stage. Irit, an attractive 20-something, is Eran's best friend who soothes his loneliness. She is always there although she knows she will never find herself a straight guy so long as she 'plays house' with a gay one. Ben, while focused on finding a decent job, can't help but be distracted by his lifelong dream: seeing a Eurovision contest ... live! This is the story of the flashiest troop in Tel Aviv. A story about love, friendship, loneliness and an uncompromising and unapologetic obsession for the world's kitschiest song contest.